GOLD PRICES held in a tight $5 range around $1213 per ounce Tuesday morning in London, moving sideways against a weaker US Dollar as commodities edged higher and Donald Trump issued a warning to other countries over doing trade with Iran – now back under US sanctions over its nuclear research program. With gold prices barely $10 above last week’s 12-month lows, world stock markets followed Wall Street higher, adding over 2.9% to China’s main equity index as the Yuan extended its rally versus the Dollar on the currency market. The UK gold price in Pounds per ounce meantime ticked a 2-week high just below £938 as Sterling fell after both the National Farmers Union and the Association of Police & Crime Commissioners warned against a “no deal” Brexit – now 60/40 likely according to trade minister Liam Fox, “uncomfortably high” odds according to Bank of England chief Mark Carney. Despite the rise in trade and geopolitical tensions, investment in gold-backed trust funds shrank by 1.6% in July new data showed today, pulling their value down to $94 billion, the lowest in 12 months. Private investors, in contrast, grew their physical bullion holdings at the fastest pace since December according to data from BullionVault this morning, with major coin fabricators also reporting a sharp rebound in business during July’s price drop. 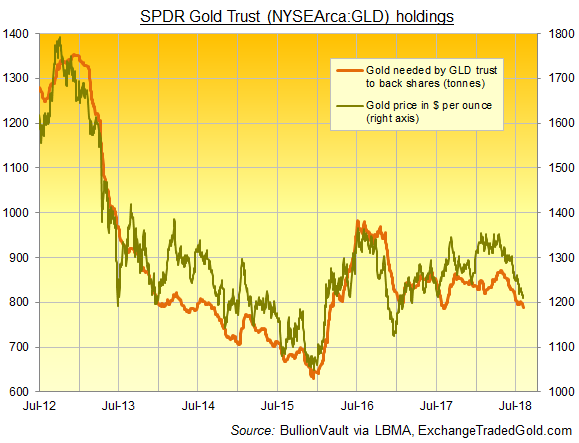 The largest gold-backed ETF, the giant SPDR Gold Shares (NYSEArca:GLD), yesterday shrank again, reduced by 0.8% as investors sold once again. That took the amount of gold needed to back the GLD’s value down to a new 12-month low at 788 tonnes. The GLD peaked in size with 1,353 tonnes at end-2012. Silver’s largest ETF product has also bucked the trend in gold-backed trust funds, with the iShares Silver Trust (NYSEArca:SLV) ending Monday at its largest size in almost a year to need 10,274 tonnes of bullion. Silver outperformed gold prices in London on Tuesday, edging above last week’s finish to trade at $15.46 per ounce. Platinum prices also recovered Monday’s drop, adding 1.9% to near last week’s peak around $840. The Chinese Yuan meantime extended its rally from Friday’s new 15-month low, adding 1.0% versus the Dollar on the forex market. Shanghai prices held unchanged in Yuan terms, showing a premium to London quotes of $4 per ounce – less than half the typical incentive for new bullion imports into the No.1 consumer market.